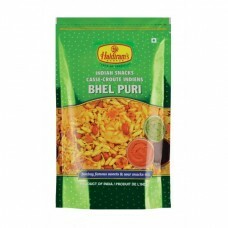 This Bhel Puri is from Haldiram's. Bhel Puri is an Indian snack which consists of puff rice, mixture and sauces. Haldirams Bhel puri is a mild spicy blend of crisp noodles, nuts, puffed rice, dried vegetables, and dried potato chips with dry chutney mix.